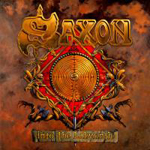 If you know your heavy metal history, particularly the age of NWOBHM, than you know Saxon. They were one of the pioneers, right in their with Iron Maiden and Judas Priest. 'Strong Arm Of The Law' pulled me and made me a fan. Yet, back in the day, they were also the whipping boys for many, the media included, for their over-the-top heavy metal. Their days and escapades are legend becoming an influence for the making of Spinal Tap. No matter, I liked Saxon then. I still dig them today and for good reason: their 18th studio album, 'Into The Labyrinth' is a beauty. This disc has it all: melodic heavy metal in the traditional NWOBM style on 'Battalions Of Steel,' the masterful and epic 'Valley Of The Kings,' and, my personal favorite, the amazing 'Come Rock Of Ages;' a bit of power metal on 'Demon Sweeny Todd;' and some true hard and heavy metal on 'Protect Yourself' and faster, more melodic, 'Hellcats. Of these, I was most pleased with the melodic metal stuff. Where Saxon really surprised and grabbed me was with their more melodic hard rock numbers. 'Slow Lane Blue's is a complete hard rock blues song perfectly executed with a good pace, great vocals from Byford, and thrilling fret work. 'Crime Of Passions' and 'Live To Rock' are hard rock numbers with enough boogie (especially Live to Rock) that puts the latest stuff by AC/DC to shame. To top it off, Saxon delivers an acoustic (bottleneck slide) blues version of 'Coming Home' from 2001's 'Killing Ground.' Biff Byford could easily quite his day job and sing the blues without skipping a heartbeat. My only disappointment was with 'Voice,' a song which couldn't decide if it was hard ballad or a hard rocker. 'Into The Labyrinth' is prime vintage Saxon; they're the Clint Eastwood of melodic metal and have never sounded better. This is a great album that I could easily put next to the early classics 'Strong Arm Of The Law' or 'Denim And Leather.' Highly recommended!